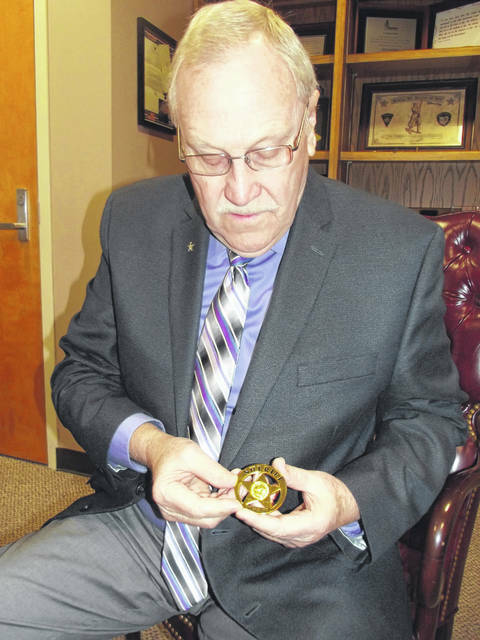 Shelby County Sheriff John Lenhart looks at the badge he designed celebrating the county’s bicentennial. The Shelby County Sheriff’s Office bicentennial badge was designed by Sheriff John Lenhart. 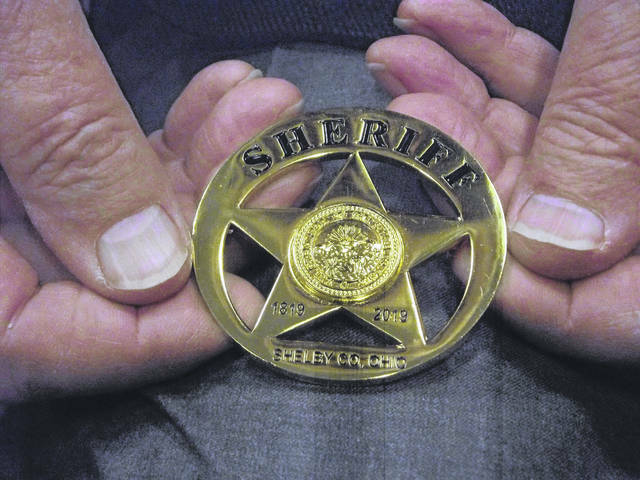 SIDNEY — A one-of-a-kind badge will be worn by Shelby County Sheriff’s Office deputies to recognize the county’s 200th anniversary. Sheriff John Lenhart designed the badge, which includes the years 1819 to 2019 to commemorate the bicentennial. “This is the second time I’ve designed a badge,” said Lenhart. He designed his first badge when he was employed by the BCI. He said the county’s bicentennial is a significant milestone and he wanted his office to be part of the celebration. Ebenezer Sproat was the first territorial sheriff for the area, said Lenhart. He was a surveyor by trade. He was a colonel in General George Washington’s army. The first sheriff for Shelby County was Daniel Dingman Sr., who served from 1819 to 1820. Lenhart said 50 commemorative badges will be given to all the road deputies, detectives and a few select other Sheriff’s Office staff members.